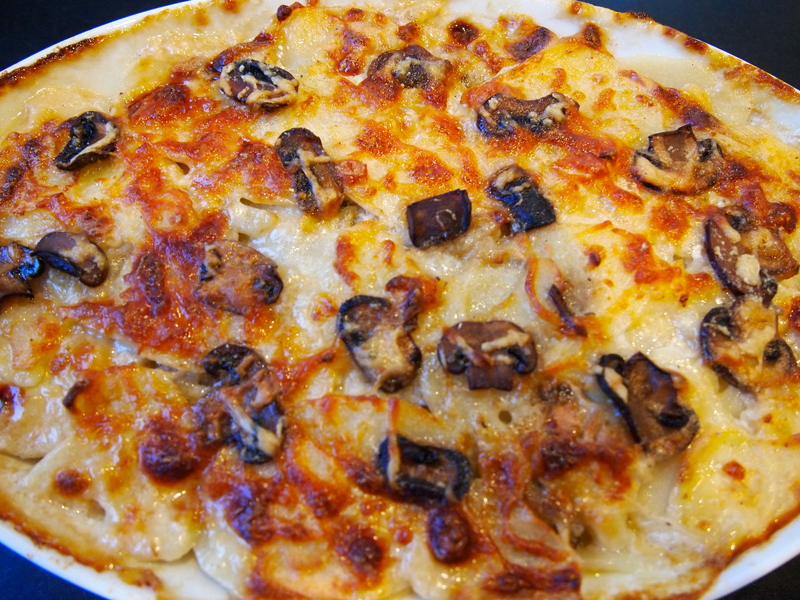 I love gratins of any sort but the classic potato gratin or pommes Dauphinoise has to be my favourite. It’s rich and creamy and makes the perfect side dish. 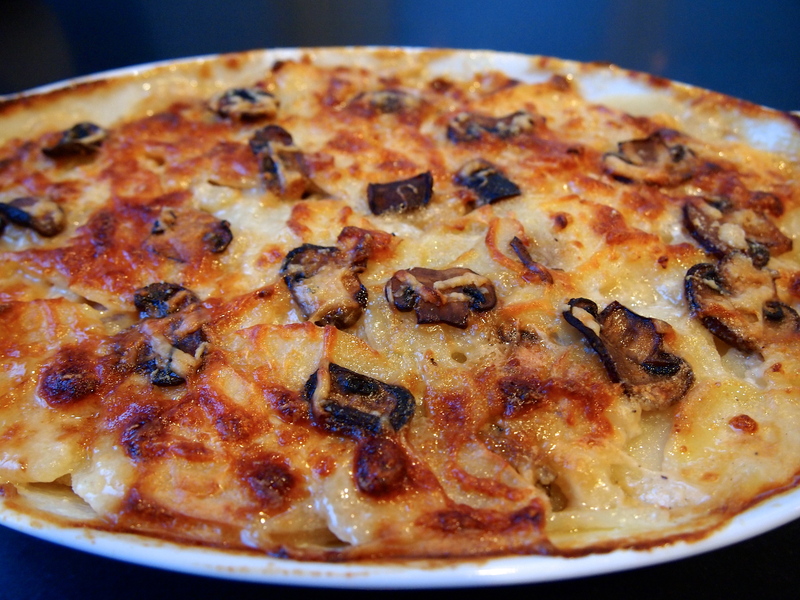 Purists say a classic potato gratin should not be made with cream, with some going so far as to say no cheese either. Whilst I agree with the former and use whole milk (not skim) I do love the addition of Gruyère cheese in a potato gratin. 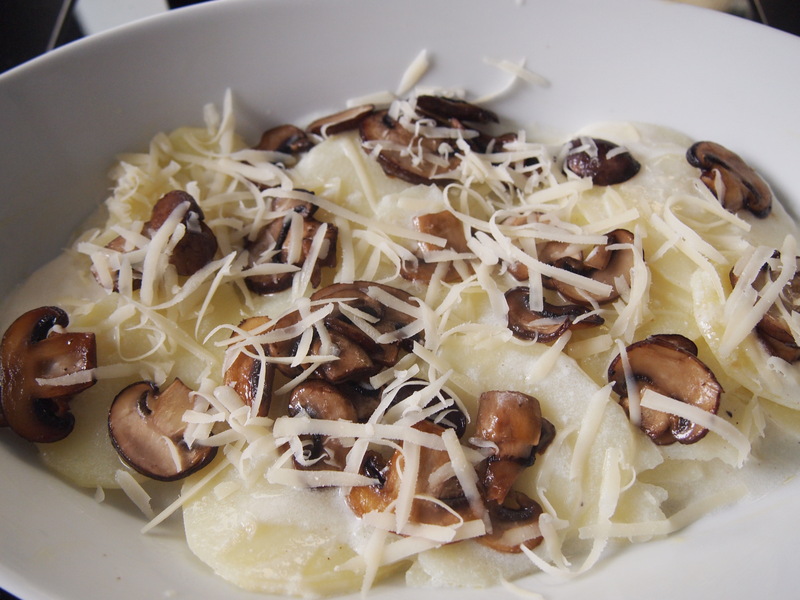 I’ve gone one step further in this version and added some sautéed mushrooms which add a lovely earthy note to the gratin. If you’re lucky enough to have access to fresh porcini or ceps these would be amazing here. 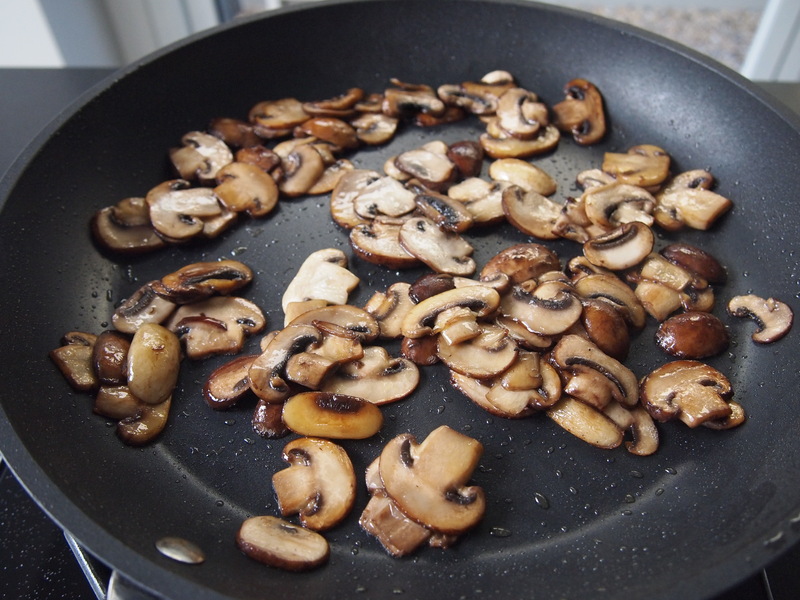 I used Swiss brown mushrooms which are similar to chestnut mushrooms or baby portobello’s. I’ve noted in the ingredients the optional addition of truffle oil which really takes this to another level. One thing that I think is vital for a gratin is for the potatoes to be sliced very thinly on a mandolin. If you haven’t got one then use the finest slicing blade on your food processor. If you haven’t got access to a mandolin or a processor then slice them by hand, take your time and try and cut them as thinly as you can with a uniform thickness, which is vital if the potatoes are to cook evenly. There are two ways of making a potato gratin, the first is to just layer the potatoes with seasoning etc and then cover with milk and bake in the oven. 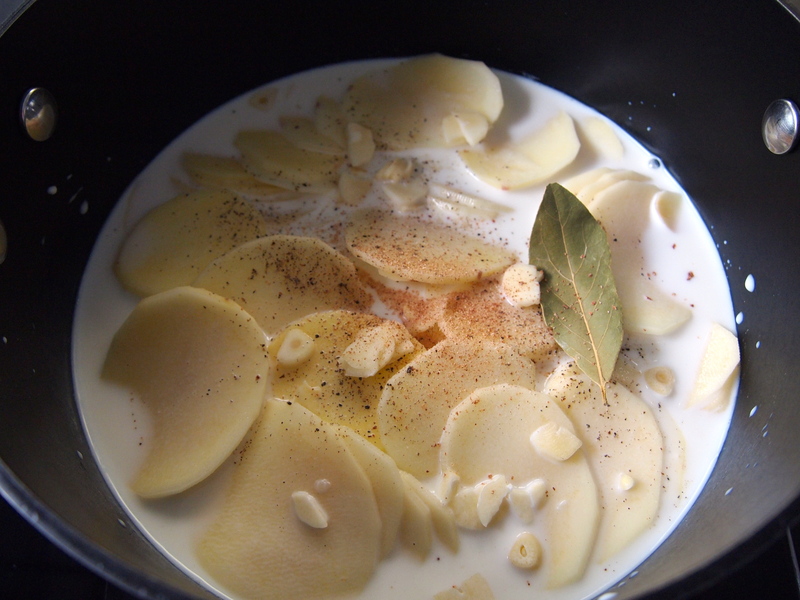 The alternative method, and the one I prefer, is where the potatoes are first blanched in the milk to start the cooking process and then placed in the gratin dish to bake. I find the texture of the potatoes is better this way and it also cuts down on the baking time. If you’re cooking a roast lamb for Easter Sunday lunch this gratin would be a great accompaniment, and if you’re short on time and oven space it can be prepared in advance and then put in the oven to bake while the lamb is resting. Peel the potatoes and slice them thinly on a mandolin. You want them to be slightly thicker than a potato chip/crisp but not paper thin. If you don’t have a mandolin use the finest blade setting on a food processor. Place the sliced potatoes in a saucepan that is more wide than it is tall and is large enough for the potatoes have a little bit of room. Pour enough milk to just cover them – the amount of milk you’ll need will depend on the size of the pan, which is why it’s better to go for something wider than taller. Add the garlic, bay leaf, nutmeg, some salt and pepper and bring to a boil. Lower the heat straight away to a gentle simmer and cook for about 20 minutes or until the potatoes are just tender. During this time you’ll need to stir the potatoes gently, scraping from the bottom of the pan to ensure the milk doesn’t get scorched. Once the potatoes are cooked taste for seasoning and adjust if necessary.Whilst the potatoes are cooking, heat the butter in a skillet and cook the mushroom until they are golden brown and all the moisture has evaporated from them. Season with a little salt and pepper and set aside. Pre-heat the oven to 180C. To assemble the gratin take a shallow oven proof dish and spoon in a layer of the potatoes along with some of the milk. You won’t be able to layer them precisely as the potatoes are hot and wet but just even them up as best you can. Add a sprinkling of Gruyère and some mushrooms. Repeat the process until all the potatoes are used, with the final layer being the remaining Gruyère cheese and the parmesan. If you are using the truffle oil trickle this over just before you add the final layer of cheese. Depending on the size of your dish you should have about 3 or 4 layers. 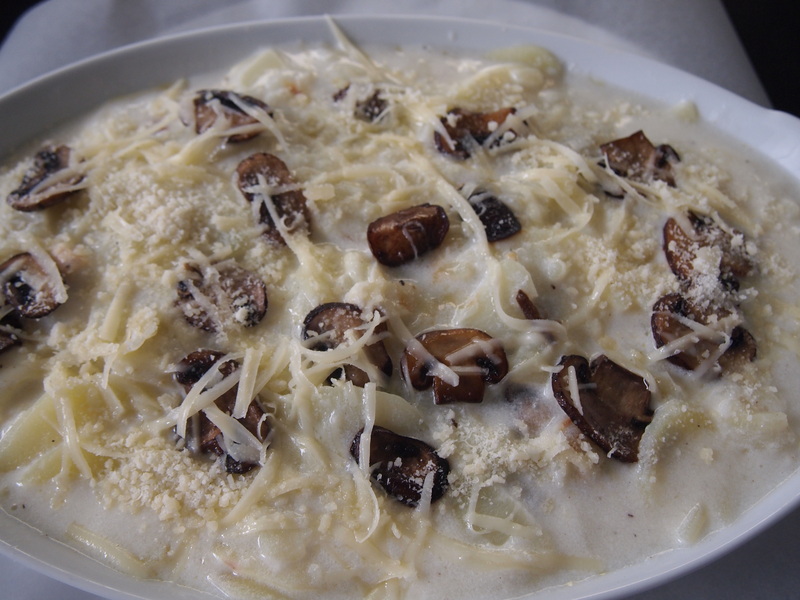 Most of the creamy milk in the saucepan will be used up but if there is any left, drizzle it over the gratin. Bake for about 30 minutes (it’s wise to place it on a baking sheet to catch any drips) until it’s golden and bubbly.